There are so many girls facing the problem of gray hair. Now a days gray hair is a major issue for girls who have to travel all day or have to go out at any time of the day. Some time gray hair become the joke for others and matter of shame or embarrassing for the girl or the lady. Before going in details about best way to cover gray hair you must know causes of gray hair first. Unhealthy living habits of people. Take a bowl and add one cup of heena powder and pour some water. Make a medium paste and leave it for 2 to 4 hours or if you can wait then leave it for over night. Just part your hair in sections and apply this paste on the scalp and hair with the help of a hair colouring brush. Leave it on the scalp for 3 to 4 hours and wash it with any shampoo and conditioner. You can use heena twice or once in a month. It depends upon your hair growth also. But you need to do root touch up at least once a month. It reduces the amount of hair fall, make it dandruff free, and also improve the hair growth. Cut the Amla into 4 pcs and leave them in the sun for 8 to 10 days. Take them and grind the dry Amla in the grinder. And the Amla powder is ready. Take 2 tbsp of Amla powder and mix it with water or curd and make a nice paste. Divide the section of hair and apply it to the scalp and hair roots equally. Leave it for 2 to 3 hours. Then wash your hair with a good shampoo and conditioner after that. Amla has some fatty acids which strengthen the hair follicles and make it strong. It also give nice natural colour to the hair and also promote hair growth. Juice from 1 medium size onion. Extract the juice from the onion and apply in on the scalp with the help of a cotton ball. Do this twice a week for great results. It has enzyme catalase in it which helps to colour hair naturally. It also add volume to the hair.There are many more hair mask you can try using Onion Juice. Take a saucepan and pour coconut oil in it heat it up. After this add the fenugreek seeds in it and leave it aside until it gets completely cool. After it became cool remove the seeds and pour the oil in the container. Apply this oil on scalp and leave it overnight. In the morning wash it off with a shampoo of any brand. Do this twice to thrice in week. It contains lecithin and some amino acids which help to make gray hair less bothering. In a bowl take all the ingredients and mix them together to form a paste like consistency. Part your hair in sections and apply on layer of the paste. Leave it on your scalp and hair for about 1 hour. You can do this twice a month. Reetha is known to be filled with iron which give hair a nice black colour. Shikakai has the quality of vitamin c which make the reetha last longer. Take a pan and heat the coconut oil and add the bunch of curry leaves into it. Keep it aside until it gets completely cool. Remove the leaves and pour the oil in some bottle. Apply this on scalp and leave it overnight. It prevents the premature hair graying. Make the hair soft and shiny. It also reduce the itching of the scalp. Half tbsp of lemon juice. Take a bowl and mix both the ingredients. Apply it on the scalp in circular motion. Leave it 2 hours and wash it off with any shampoo. Coconut oil condition the hair and make them strong. Where as lemon is very effective in treating gray hair problem. Just after washing your hair with shampoo. Take a mug and add about ¼ part of apple cider vinegar and pour it on your scalp. Leave this for 15 minutes. Do this with every wash.
Apple cider vinegar is a great way to maintain your scalp’s health. It has melanin in it which help to slow down the growth of gray hair. A full cup of brewed coffee. Heat up some water and add coffee in it. Boil it and set it aside until it gets cool. Pour it on your scalp and massage it in circular motion. Coffee is good for hair growth and also to make hair strong. 4 tbsp of Amla powder or juice. In a bowl add heena and amla powder or juice and some water to make a paste. Keep it aside for whole night or for 2 hours. Apply this on your scalp and leave it for 1 hour. Rinse your hair with normal water. Heena and Amla both make a good combination for your hairs. Both make hair more shiny and smooth. Soak the fenugreek seeds in water over night. In the morning remove the seeds and make the paste of it. Apply this paste on scalp and leave it for 1 hour. Rinse your hair with the water of seeds. Fenugreek seeds contain lecithin and essential amino acids which helps to treat gray hair. Boil the black tea leaves in water and keep it on steam for 5 minutes. Let it cool. Apply it on the scalp and leave it for 1 hour. Black tea is known for staining the hair. It also make hair shiner. Take the beetroot and grind them nicely. Take out the juice and pour it in a saucepan. Add some water and cornflour. Boil it for 5 minutes and keep it aside to let it cool. Apply this paste on the scalp and hair and leave it for 4 hours. Do this once in a month. Beetroot has staining power and also it makes the hair shiny and silky. Boil the potato peels in the water until it gets a starchy consistency. Remove the peels and fill this liquid in a mug. Wash your hair and condition them. After that rinse your hair with this solution. Do this 1-2 a week. It is a best solution as this starchy solution act like a mask for hair and make it pigmented. Heat the coconut oil and add the seeds in it. Keep it cool and leave it in the sun for 7 days. Apply this oil to hair and leave it overnight. Black sesame seeds has some essential elements which helps to make gray hair natural again. Heat up the oil and apply it on the scalp in circular motion. Mustard oil contains protein which helps to grow hair and make them healthy and strong. It also colour your hair naturally. Heat the coconut oil and add heena leaves. Remove the pan from the heat and kept it aside until it gets cool. Apply this 2 hrs before washing hair. Do this on every fortnight. Coconut oil makes hair soft and shiny. Whereas heena coloured your hair. It makes your hair look like nicely coloured. Heat the oil in a pan and add the Amla powder or dried Amla in to it. Keep it aside. When it gets cool, transfer it into a bottle. Apply this oil overnight or for 2 hours. Amla colour your hair and make them strong, healthy and shiny. Coconut oil makes hair soft. Apply the oil in the night and massage it gently and in circular motion. Wash it with any mild shampoo and than don’t forget to apply conditioner. Every time before hair wash.
Bhringraj is a ayurvedic remedy to treat gray hair from ages. It will make blood circulation better which result in less gray hair. It also lessen the hair problem. Boil about 2 cups of chamomile tea and let it cool. Pour it in a mug. Wash your hair with shampoo and do condition them. Then rinse your hair with chamomile tea. It contains darkening properties. 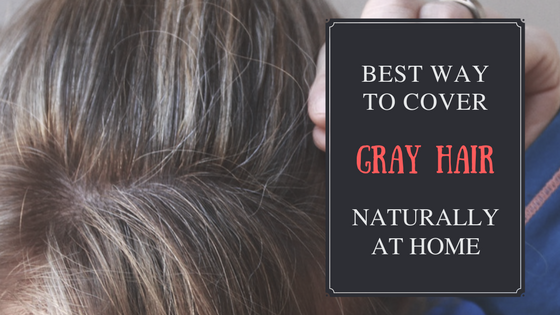 With the regular use of this remedy it will cover gray hair. So, these are some simple and effective remedies for covering gray hair. Do this remedies and see the result in near future. Wow! I didn’t know onion, potato and apple cider vinegar can cover grey hairs! Thank you for sharing such an amazing post! My goodness Roshni you’ve done such a remarkable job! So many tips that I have literally bookmarked this post. Particularly helpful for premature graying of hairs. Never knew beetroot or curry leaves could work to combat graying of hairs. I really love the simple and effective diy tips you share. Will surely try these out for my husband. Those are some really helpful tips , very coat effective that can help cover grey colour. My mom really need to try these tips on her hair and I am gonna defi. recommend these to her. This is quite an exhaustive list of easy home DIY ways to cover greys. I swear by beetroot henna with few herbal mix of powders.